Frame: 1925 Mears & Stainbank, in a frame foundation for six. 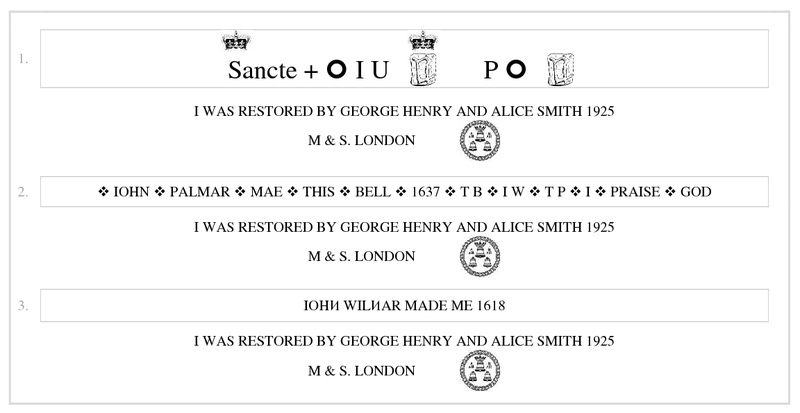 1513 - 1523 Bell cast by William Culverden (future treble of 3). 1618 Tenor bell cast by John Wilnar. 1637 Middle bell cast by John Palmar. 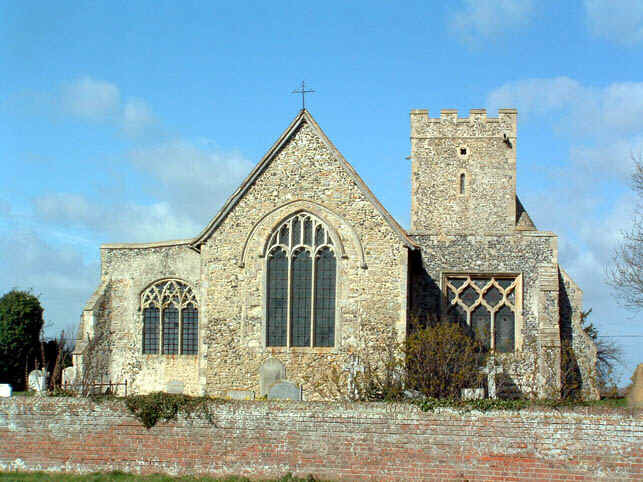 1871 Treble moved to neighbouring St Bartholomew, Goodnestone. 1887 Stahlschmidt reported that "The Belfry is in a most disgraceful state, by far the worst I was ever in. There are pits for four bells and of the three that hang only the largest is in use or useable and as that is 'clocked' it will probably soon share the fate of the rest ... the whole of both bells and frame is filthy and dilapidated beyond description." 1912 The bell that had been taken to Goodnestone was recast into a smaller bell by Mears & Stainbank. The turret at Goodnestone was also rebuilt at this time. 1925 Bells recast and rehung with frame foundation for 6 at a cost of £316.17s.6d. The new bells rang for the first time at Christmas. 1970 Bells overhauled by Whitechapel. 1983 The small 14th century bell from Goodnestone by Faversham was taken to Graveney for display. 2005 Ringing resumed at Graveney after a gap of 6 years following work to the roof of the tower. The ringing room was moved upstairs from the ground floor.